​There's nothing quite like football in the snow. And, because of its rarity, especially on these shores, it always seems to throw up some magnificent moments when it happens. So, here's seven of the best snow-drenched (is that a thing?) games from around the world in recent memory. Take it away, Rudolph. Or Frosty. Either one. Cologne blew a 3-0 lead to slip to defeat to relegation rivals Freiburg in the heavy snow - in a game that will also be remembered for a lost penalty spot! Not only did this game offer mountains of snow for the whole family to enjoy, it also had goals, tension and a remarkable comeback to go with it! Pitted as a relegation dog-fight, the inclement weather only seemed to spur these two sides on - albeit at completely different times in the game. It was Cologne who came out the most excited, scoring three goals in the first 29 minutes to surely bring home some festive cheer for their fans. But any snow angels were premature, with Freiburg quite unbelievably scoring four goals in the proceeding sixty - with the winner a 95th minute penalty, initially delayed by an inibality to find the penalty spot. When people say a game had everything, I'm certain it didn't have as much as this one. What a rollercoaster ride this one was. Expected to be called off on the day, referee Stuart Atwell was having none of this snowflake mentality (if you will), and gave it the go-ahead. While primarily covering the pitch beyond recognition, the blizzard also did something to freshen up a struggling Ipswich side who had lost their last six games on the bounce. Because Roy Keane's Tractor Boys flew out of the traps and, akin to Cologne, managed to snag a 3-0 lead before the first half was up. It was then that the controversy started. Half time was elongated to ensure groundstaff had sufficient time to temper the pitch, though a second break was required in the second half when Richie Wellens took a spectacular tumble. Foxes were begging for the match to be abandoned. Roy Keane & co were adamant it be completed. In the end, it was, and it finished 3-0 to Ipswich, with ​Leicester ending the game with 10 men following a popped hamstring to Angelo Miguel Vitor. Lovely stuff. I mean, would you look at that. If there's one country that knows how to do a snow game right, it's the U.S. of A. While we've seen it countless times in the NFL, this is perhaps the greatest example during *braces for impact* a soccer game. Ultimately, the spectacle on the pitch wasn't all that memorable, with the USMNT grinding out a 1-0 win over their Central American counterparts. Surprise, surprise it was Clint Dempsey who grabbed the winner, as he so often did. But the atmosphere and festivites in the face of a considerable blizzard in Colorado on that night are what makes it one to remember. USA! USA! USA! 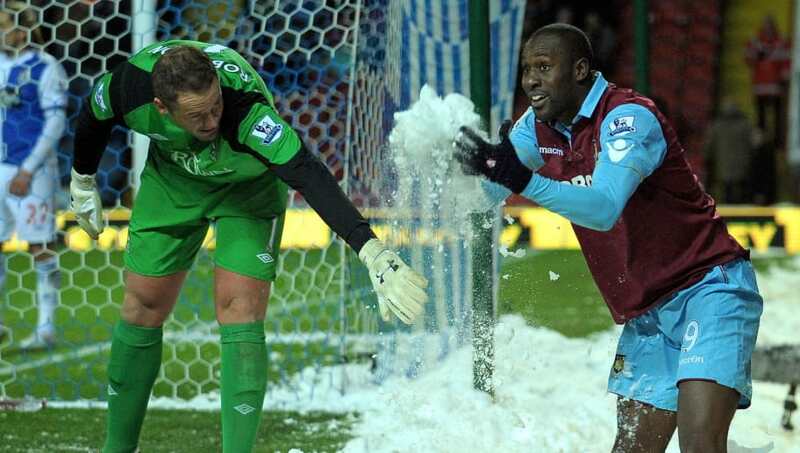 Again, not the most classic of clashes on the pitch, but Mr Snow (..Jon?) was certainly the standout player. The best thing about this one was that the blizzard was gradual. At first, the game actually seemed almost playable, with the snow abating, but as the game wore in, the weather became increasingly worse, until fans could barely see what was going on. Half time was extended so officials and managers could try and get a call through to organisers to forfeit the game, but they were unsuccessful. If you were at the Saint Symphorien stadium that night, and are still unsure of what happened - I can tell you that it finished 0-0, but there was a red card when Neal Maupay shoved Sylvain Marchal. Three years later, you're welcome. Not strictly a snow game, seeing as the groundsmen were for the most part successful in their attempts to clear the pitch, but it sneaks in here thanks to a staple of any true snow game - the snowball fight. And who would you rather watch compete in such an encounter than Carlton Cole and Paul Robinson. I mean, when I say fight, Cole threw some snow in the air after falling in a pile and Robinson, in the act of helping him up, was hit with specks of the collateral. But still, 1-0 Carlton. Oh, and the game itself finished (Steve Kean's?!?!) Rovers 1-1 (Avram Grant's?!?!) ​Hammers, I should add. A return to good snow-induced football, we have Augsburg versus Hoffenheim. A firecracker - or snowcracker? Oh, wait - a Christmas cracker of a game, featuring the great and the good from world football. To kick things off, you had Hamit Altintop's identical twin Halil open the scoring in the 39th minute, before *squints* Timo? No sorry, Tobias Werner (no relation) doubled the home side's lead. However, Liverpool's ​Roberto Firmino sprung Hoffenheim back into the game with a strike on the stroke of half time. This set things up for a back and forth second half, with thrills, spills and slips a plenty, but ultimately Augsburg assured themselves of a win with Raul Bobadilla's 93rd minute goal. What a glorious, glorious game this was. In a Champions League group game decider, the Turkish giants entertained I Bianconeri at the Turk Telecom Stadium. It kicked off on a Tuesday night, but after 32 minutes the conditions were deemed unplayable and it was postponed until the following day. Come kick-off on Wednesday, though the pitch was cleared of snow at least up to the sidelines, it had told - providing a sloppy, unreliable surface. Chances were spurned on either side, though ​Juve were less adventurous, safe in the knowledge that a point would send them through. But, in the 84th minute, Wesley Sneijder ran onto a trademark Didier Drogba flick on, and snatched the victory with a cool sliding finish through Leonardo Bonucci's legs. Instanbul erupted, and the Dutchman's mud-covered jubilant celebrations are still a ​joy to behold.